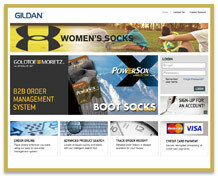 Montreal-based Gildan Activewear acquired Gold Toe Moretz Holdings and its iconic GoldToeMoretz (GTM) sock brand in 2011. Retailers of GTM and related licensed brands, such as Under Armour, New Balance, Kathy Ireland, etc., needed a simple, easy-to-use business-to-business (B2B) application to simplify their purchasing. 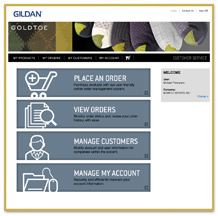 Gildan, in its commitment to superior customer service, invested in a new e-commerce platform that would make it easy for their retail customers to place and track an order. GTM already had an online order management system that did not succeed in transacting a significant proportion of the company’s sales. The system was complex, difficult-to-use and many years behind modern e-commerce standards. In addition, it was estimated that $30 million in annual sales was processed manually by GTM. Having employees process purchase orders by hand resulted in a high cost-per-transaction, the necessity for costly dedicated resources, the erosion of margins on each unit sold, and the forfeiture of efforts geared towards opening new accounts. HTC sought to provide a very simple, clean and intuitive interface. 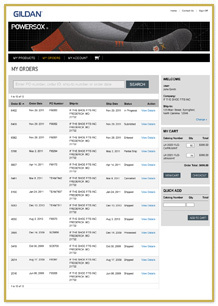 As an e-commerce application, the GTM B2B online order management system had to present few distractions for a user trying to place an order. The Gildan brand was to remain omnipresent but not invasive for the user. For this reason, the Gildan logo was included in the page header. Licensed brand logos were included sparingly. Subtle, branded, product-related banners were used in recurring places throughout the site. HTC was tasked with building GTM’s brand new profit-driving B2B e-commerce application and integrating it with GTM’s enterprise resource planning (ERP) system. After careful analysis and planning, HTC simplified the existing application’s information architecture and designed a clean, new interface that would ensure the best-possible user experience. Development challenges were then addressed by building the new application on the IgnitionWeb Marketing Platform and integrating it seamlessly with GTM’s SQL database and ERP. Functionality with which customers were already familiar was replicated and optimized wherever possible throughout the application. GTM administrators were empowered to manage all customers and users with ease and confidence. They were given the ability to change the banners throughout the site and designate them for specific user types. Facilities for emailing targeted users were integrated to enhance communications. Administrator Manager, Media Centre, EasyText Editor, Membership Manager, Mailing List Manager, Promotions Manager and Site Statistics. Gildan received a top-tier e-commerce platform that encourages purchase behaviour while fostering loyalty for the GTM brand. It is clean, simple and easy-to-use and will shift a significant proportion of new and existing accounts to a far more cost-effective distribution channel. The retail account growth rate is exhibiting steeper growth than ever as the brand is becoming more profitable. Accepting more credit card payments online directly contributes the improvement of receivables. The costs associated with processing orders will decrease, making GTM more efficient. With the new B2B online order management system, GTM will expand its distribution and is poised for further growth and continued success.